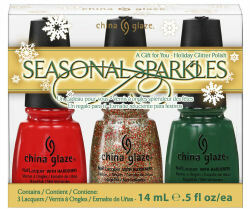 China Glaze Seasonal Sparkles Nail Polish Holiday Gift Set. Included in the set: China Glaze nail lacquers, full .50 oz. size each, Poinsettia, Holly-Day and Free Twinkle Lights, .50 oz.